Our full band was in dissolution after personal issues and lack of cohesion left us stagnant. With the blessing of retired members, Krolikowski carried on with a solo writing process, which took all of Summer 2012. Fifteen songs were shared with Fudurich and Forsythe, and narrowed down to the strongest ten for the album. As a multi-instrumentalist, Krolikowski was able to put together cohesive demos using a full set of sounds from in and out of the box. Although they are not very present on the final recording, the microKORG and the ZOOM G2 were great tools in the writing stage. Repeater worked with Fudurich on a previous album, Iron Flowers. We have been friends and mutual fans for a few years now. His space is a big loft, which [also] functions as a great drum room. There are also options for cabinet and vocal isolation. There are enough vintage and modern gear [options] to record a full band, so the way we did it, there was no problem at all getting great signals for each take. Krolikowski was even able to take on the duties of recording backing vocals at his place. Repeater’s sound has always been marked, and sometimes marred, by complexity in rhythm and deviation from standard song structure, either towards the minimal or progressive ends of the spectrum. With these songs, we tried to keep the rhythms interesting but extremely simple. The song structures are also a little bit closer to the pop standard. Because of the lack of time constraints, we added as many parts, layers, percussion accents, and vocal textures as seemed necessary to make this recording competitive with contemporary indie music that we respect. We used electronic beats to write the songs but then reinforced it with groovy, minimal playing from one of our favorite local drummers. Steve and Tess were extremely careful to sing with restraint and to limit lead vocal melody to the most accessible range. This is a calculated sound, but the songs within are stronger than ever. Repeater’s last release, Golden Ships EP, was the opposite type of recording. That was done quickly, with full band takes, few overdubs, and was mixed much later with little addition. The record before that, We Walk From Safety, was very elaborate but had a very live process to establish the initial rhythm tracks. This recording is very organic because of its long iterative creation, but it’s not traditional in any way. The style and character of this recording has been shaped by the entire year-long process, and there was no intent of capturing a specific moment or sound. How did your past experience lead up to this recording? Repeater as a unit has recorded three EPs and two full-length recordings since they started out. Fudurich did the first full length, Iron Flowers, and Ross Robinson did the second, We Walk From Safety. By the time we disintegrated as a full band, the wheels were already turning to do another recording with Fudurich. Krolikowski had done a lot of recording, mixing, and writing with and without Repeater, in addition taking on the vocal and lyrical responsibilities for Fear and the Nervous System and finishing Repeater’s Golden Ships EP, recorded by Paul Larson and mixed by Josh One. As a creative machine, the band had become stagnant. The remaining members and Fudurich decided it was worth it to take on a full album project, no matter what form it took at the end. We used pretty much every recording technique at our disposal. MIDI arpeggiation and playback through analog gear, and knob turning was the basis for a lot of the rhythm tracks. The drums are all hybrids between programmed and real playing. The mixing stage will employ even more techniques, going in and out of the box, with vocoders and other processors. For this recording, we didn’t have much of a choice. The groove has been established by programming, editing, and then playing naturally over the top of that. Everything is an overdub, based on solo demos, so that live band feel is missing. This takes away some of the rock, and makes it more of a pop creation. There are very few fills, few tempo variations, only changes in groove and dynamics. Bass and drums and guitar and percussion were done in fluid full takes whenever possible. Synths were captured as performances as well. The end result will be something more dynamic than a typical rock record. When you make a record this way, you have a lot of freedom. You can be lazy and make all the songs sound the same, or you can challenge yourself to make the songs what you imagine them to be, using every trick and every idea, adding and removing until it sounds right. When you have no specific time limit on the production of a record, it is hard to keep at it when priorities change from week to week. Scheduling different sessions, sharing editing tasks, and continuing to develop the sound throughout the process can make it stretch on too long. How will you handle final mixing? It’s an iterative mixing process that could involve additional editing, drum sounds, and orchestration. Fudurich is a technically-grounded engineer with a huge catalog and a great ear for every type of sound. Krolikowski has a taste for more aggressive or ambient use of mixing and effects. Forsythe’s critical taste for pop and contemporary indie music will come through the mix, as well. We want as much dynamic range as possible while still sticking to an album sound. Will you do a vinyl release? If we can afford [it] there will be a nice, minimal package with as much care and thought put into it as such a project deserves. Have a unique studio story to share? 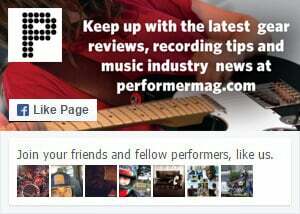 Email editorial at performermag.com.